it must be a great experience being part of an international sporting event…although its not the Olympics but yet. I’m glad you’re enjoying your stay in Finland, but I must remind you that most of your observations tend to be rather cosmetic. Finland is a beautiful country, and there are great social services… yet the things that bother Finns tend to be the things they don’t talk about: namely, the price people have to pay – in terms of taxation – for such a society. Add to this the growing awareness that the welfare state economy is sustained by exports to non-welfare state consumers (US consumers), and you have a recipe for some unease (and one of the fundamental causes for ingrained anti-American bigotry). Are Finns exploiters? Freeriders? Or have they truly devised a better way? Those are the issues that pre-occupy the Finns. Yeah Patrix, it sure is great! Every day we have some new and interesting thing to watch..especially due to such a mega scale event.. and more so due to the chance of seeing such an event in India being near nil currently..BTW this event is supposed to be just second to Olympics in grandeur. Hi Finnpundit, thanks for visiting! I guess you’ve been in Finland for long, compared to my (not even) 2 months..well, as you observed correctly, my blog consists of mainly “cosmetic” things .. and that is the way it is intended to be consciously because it is a ‘travelogue’ and is entirely from a tourist POV.. I am really not into ‘analysing’ anything be it the state of minds of the Finns or whether they are free riding at all..at least not at this point of time, when I am still just absorbing in every experience ..
Too bad that your search for accom has clashed with the sports event. All the best n hope u find a good one. I read in the newspapers that its carnival time in finland, no wonder you are having quite a lotta fun! 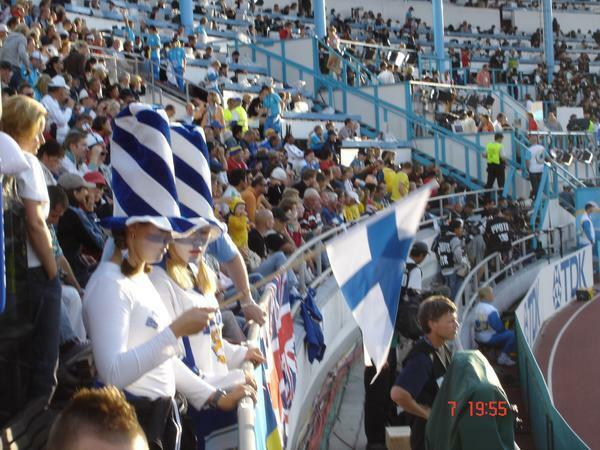 Keep the ‘finnish’ posts coming! Sure Johnny boy..that’s one reason why I try to give err..detailed accounts :)..
and I did make some arrangement soon enough for accomodation though I had to change 2 because of that! Once you have travelled enough, is there anything that really excites you anymore OR something you feel is a completely different experience? I write this as I begin to plan my weekend on a lazy thursday afternoon :), so pls. forgive the solemn tone! Open invitation to you and anyone else, If you parcel me a “aloo ka paratha”, I will send you riches beyond your wildest imaginations! johnny boy, I wish I could, I wouldn’t have won anything, but at least I wouldnt have doped like Neelam Jaswant Singh. Don’t talk badly of Neelam Jaswant Singh. Doping is pretty good fun … you should try it sometime! It’s not at all harmful to the body (or addictive) – I would even go to the extent of saying that your “aloo ka parathas” loaded with indian ghee (!!) are more harmful to the body! On that note, have you guys ever wondered, why all the best tasting foods are also the heaviest on calories! Why can’t we have good food that is low on calories?